In the contemporary mobile and cloud-first enterprise scenario, the best way to drive business results is to keep abreast of the trending technologies that make working easy from both ends; the employees as well as the employers. So how to make the business processes smoother and maximize efficiency, control and profitable? Enter applications! Today’s enterprises deal with several hundreds of applications for streamlined business. Efficient management of these applications can work wonders on the business turnover and the overall performance and standards. This involves ensuring best practices, techniques and procedures essential to a deployed application's operation throughout the company and back-end IT infrastructure. It encompasses everything from managing, maintenance, versioning and upgrading of an application throughout its lifecycle for delivering the desired results. There are several application management solutions provider offering quality software solutions and maintenance services that are capable of transforming the application landscape of the enterprise to a more modernized environment. To help CIOs navigate the application management solutions landscape, CIO Review presents a special edition on AMS. In the last few months, a distinguished panel involving CEOs, CIOs, VCs and analysts including CIO Review’s editorial board has evaluated scores of vendors in the AMS area, and shortlisted the ones that are at the forefront of handling industry challenges. The selection panel looked at the vendor’s ability to fulfill the needs of buyers with viable solutions that add value to the application management landscape. 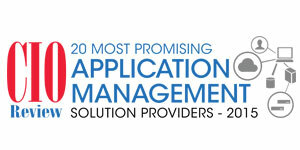 We present to you 20 Most Promising Application Management Solution Providers 2015. Bramasol Inc Bramasol delivers business solutions for mid-to-large sized companies throughout the U.S. and India as an SAP gold channel partner. Edge Team EdgeTeam Technology is the premier Solutions Provider for information infrastructure, security, and performance management.